The Go Glider balance bike is currently unavailable. We will let you know when it is back in stock! Balance bikes are not just for younger children, and we have already examined the best balance bikes for 6 year olds elsewhere on this website. Although most children of this age are ready for a pedal bike, some children like to continue with balance bikes while others are later learners. One of the best balance bikes for older children is the Go Glider balance bike, which is suitable for children from 5 to 10 years old and generally costs around £129. The bike is manufactured by the Glide Bike Company, and is equipped with 16 inch wheels, which makes it a comfortable ride for older children. The Go Glider Balance bike looks great and closely resembles a quality pedal bike, and the low centre of gravity on the bike means that children should soon be able to take their feet off the floor to begin ‘gliding’. The Go Glider Balance bike does require some assembling, although this should not take more than about 30 minutes before you are ready for a ride. Features include a kickstand, a rear drum brake and a footrest – which can be great for the rider to stand on and perform tricks. The tyres are maintenance free EVA foam tyres. This bike is usually in available in several colours including blue, red, pink, green and orange. Although this bike is generally more expensive than most balance bikes designed for younger children, riders of the Go Glider Balance Bike should not outgrow their bike as quickly, especially with the adjustable handlebars and padded seat. Many children like to continue riding balance bikes well beyond when they can ride a pedal bike – just because balance bikes are so much fun and easy to handle! The Go Glider Balance bike definitely fits into this category, and riders should be able to build up plenty of speed and a great repertoire of tricks once they have mastered the initial skills of balancing and steering. You can also read our guides to best balance bikes for 2 year olds, 3 year olds, 4 year olds or the best budget balance bikes. Here is the Stompee Balance bike review for when it is back in stock! The Stompee Balance bike is a great choice if your child is a budding mountain biker, produced by Stomp who are a leading pit bike manufacturer. 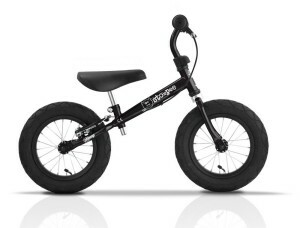 The Stompee Balance Bike is very popular as it has the appearance of a genuine mini mountain bike, helped by the chunky pneumatic tyres and quality build. The pneumatic tyres help to provide a comfortable ride, and kids will love the style of this bike as Stomp specialise in cool off road motorbikes. Other features of the Stompee Balance Bike include a steel tube frame, alloy rims and a large padded seat that is adjustable from 35cm – 45cm. The light weight frame means that the Stompee weighs in a 4.2kg, and the padded seat is really comfy! It is available in several colours including black, bright blue, bright red and hot pink. This is the only balance bike in the Stomp range, and is suitable for children from 2 years through to 5 or 6, by which time they will more than likely have outgrown their Stompee and be ready to move on to a larger pedal bike. You might find that the bike is slightly too big and heavy for a 2 year old of average height, as some other balance bikes such as a Puky balance bike have a saddle height starting at 29cm, so these may be more suitable for younger children. We have a full guide to the best balance bikes for 2 years olds here. The Stompee Balance bike comes with plenty of features for a mid range priced bike, and these include a high performance V-brake. This is applied to the left handlebar and is attached to the rear wheel so this will help your child get used to the principle of braking as they learn to steer and balance. It will also help to save on their shoes if they learn to use it properly! Check out our guide to balance bike brakes here! 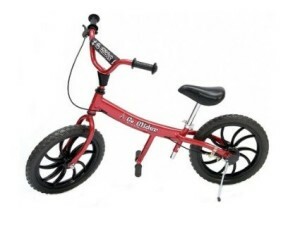 Overall, this is a great all round balance bike that looks cool and provides fantastic value at just £34 – although if you like this style of bike but can stretch your budget further then you could also consider the Specialised Hotwalk Balance bike which is priced at around £110 and offers specific models and designs for boys and girls. Happy cycling and don’t forget your balance bike accessories such as the essential helmets and kids bike gloves. Another important feature to consider when you are looking for the best balance bike is the type of tyre that you would prefer. There are several types of tyres available on balance bikes, so we thought it would be useful to prepare the Ultimate Balance Bike Tyre Guide! The most popular type of tyre is the standard air, or pneumatic tyre, which is used by several of the leading balance bike manufacturers such as Puky. The main advantage of the pneumatic tyres is that the flexing of the tyre generally provides more traction, cushioning and a much more comfortable ride, just as it does on bikes for older children or adults. The pneumatic tyres also make balance bikes appear more like standard bikes, and they come with a number of different tread patterns. They will also last longer than plastic or foam tyres. There are a few 'cons' or disadvantages to pneumatic or air tyres, and the main con is that they can be prone to flat tyres, just like standard bikes. You can reduce the risk of this by adding some tyre sealant, but it can be a hassle if your child runs over a sharp object and you need to organise a replacement tube. Pneumatic tyres can also make balance bikes heavier than those with foam or plastic tyres, so balance bikes with pneumatic tyres are generally recommended for children aged 3 or older . You may want to start off with a smaller bike with foam tyres and progress to air tyres. 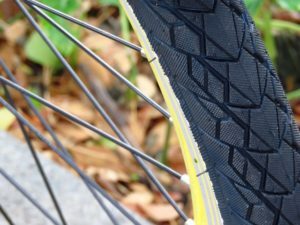 Another popular balance bike tyre type is EVA Foam tyres, where the inside of the tyre is filled with a hard, rubber foam. These tyres are preferred by manufacturers such as Strider, who use foam tyres as standard on most of their bikes. EVA foam tyres are lighter than pneumatic tyres, and the main advantage is that the solid foam means there is no risk of punctures and the tyres maintain their shape. In contrast to the pneumatic tyres, the EVA Foam tyres do not provide much 'give' and flexibility, so this can result in a bumpier ride and the rider has to absorb much more of the impact when riding on bumpy surfaces or going up and down kerbs etc. EVA Foam tyres are perfect for younger children learning to ride on smooth, paved surfaces and they also require less maintenance. Simply wipe the mud and grass off the tyre and you are ready to go. Strider offer EVA Foam tyres as standard on their bikes, but they do offer an air tyre as an optional extra on some models. Fat Boy' tyres are preferred by some manufacturers such as Early Rider, who feature them on several of their models. These tyres are larger than the standard pneumatic air tyres, and as the name suggests are fatter and wider. The larger tyre means the extra air provides more flexibility and cushioning, enhancing the comfort of the ride while providing all of the traction benefits of the pneumatic tyres. These tyres are generally found on more expensive and top end models. These are the main types of balance bike tyres on the market used by most of the bikes that we have featured on this website. A few manufacturers have started to use rubber honeycomb tyres, which combine the best of both air and foam tyres as they provide the comfort and flexibility of air tyres but are puncture proof. These tyres may become more common in the future. Hard plastic tyres are also sometimes used, but these are only really useful for indoor bikes and toys. We hope you found our Ultimate Guide to Balance Bike Tyres useful, and good luck in finding the best balance bike for your child.